Google’s growing social networking service is taking a page from Twitter by verifying accounts belonging to public figures and celebrities. On the Internet, it's often difficult to determine if a person you're communicating with is actually the person they say they are. Like Twitter before it, Google+ is aiming to change that. 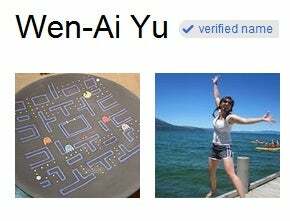 "We’re starting to roll out verification badges on profiles so you can be sure the person you’re adding to a circle is who they claim to be," Google+ staffer Wen-Ai Yu wrote in a recent company blog. For now, Google+ is focused on verifying public figures, celebrities, and people who have been added to a large number of circles, but it is working on expanding the option to more people. "Circles" are the binding elements of Google+. Any Google+ user can create circles of their acquaintances on the network. Circles can be based on anything -- a TV show liked by a member, a group of friends at work and such. Enter Google+'s badge system. Here’s how it works. When a Google+ member visits a celebrity or public figure, they'll see a verification badge next to their profile name. It looks like a gray checkmark. Hovering over it with a cursor will display the message "verified name." This penchant by Google+ to authenticate its members' identities has drawn fire in the past. A Microsoft researcher and Harvard Berkman Center fellow lashed out at the service earlier this month for its "real name" policy. It's "just plain stupid," declared Danah Boyd. By cracking down hard on Google+ users trying to open accounts with "handles" rather than real names, the company threw gasoline on a fire it could have easily kept under control, Boyd argued. "It's no longer about whether or not the 'real names' policy was a good idea in the first place; it's now an act of oppression," she asserted. At the same time, Google+ is not reinventing the wheel by verifying celebrities and public figures. Two years ago, Twitter launched a verified accounts program that allows celebrities and public figures to display a “verified account” button on their Twitter pages.